Looking for a fast and easy way to volunteer your time? 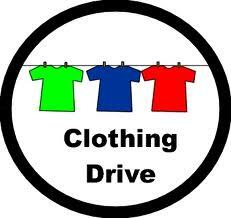 Host a clothing drive at your office, neighborhood or place of worship. Hosting a clothing drive is a great way to give back to the community with very little time commitment. The Silver City Gospel Mission is happy to work with our partner hosts to provide promotional templates for flyers and posters, as well as consult to provide maximum exposure for your clothing drive. Many corporations eagerly embrace clothing donations as a team-building or Spring Cleaning exercise that involves a minimum time commitment from staff. In most cases all it takes is approval from Human Resources, a date and a series of simple, internal e-mail reminders to staff. Clothing does not need to be stored onsite as the Mission can pick up the clothing on the day of the clothing drive. 3. Secure prizes — such as toys, frequent flyer miles, or an extra vacation day — that would motivate clothing and shoe donations from your potential audience. Check with your employer and local merchants, who would get positive publicity for their participation. 5. Publicize your event. Have fun advertising your collection drive with signs and unique displays! The more appealing your advertisement, the more your community can make a difference for those in need. Share the post "Host A Clothing Or Coat Drive"